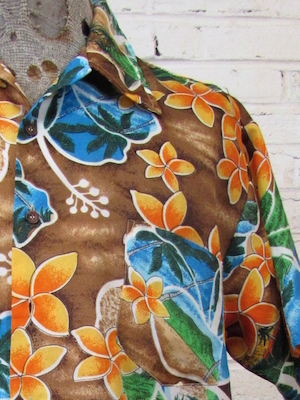 (L) Mens 70s Hawaiian Shirt! Light Sandy Brown w Vibrant Wild Floral Pattern! 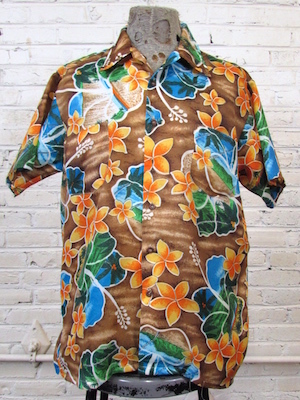 Home > Men's Vintage Shirts > Hawaiian Shirts > (L) Mens 70s Hawaiian Shirt! Light Sandy Brown w Vibrant Wild Floral Pattern! Mens vintage 1970s Hawaiian shirt! Light sandy brown base with a wild and vibrant Hawaiian floral pattern. Large white outlines of tropical flowers have a beach scene with big palm trees inside of them. Surrounding the beach scene flowers are vibrant yellow and orange flowers. Marbled brown and black buttons down the front with square patch pockets on both sides of the chest. Straight hem with a nice, wide 70s collar. Tagged by Waikiki Holiday. No material tag, but feels like a polyester blend. Chest: 45" Recommended for a Mens LARGE.